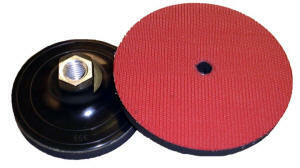 These pads can be used with hook & loop sanding discs or diamond polishing pads. 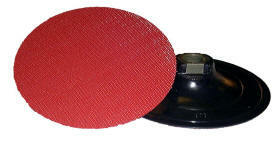 The diamond polishing discs are typically used in the granite / marble / stone trades. All of the pads have a water-feed hold in the center. They all have a 5/8-11 female metal arbor. Download 12 page backup pad catalog. The pads below are for tools with 5/8-11 arbors. If you need DA pads with 5/16-24 arbors click here. Pads with 5/8-11 arbor and no foam interlayer or waterfeed hole.